A few years ago I had the opportunity to find out what it’s like to live with a physical disability. The experience was eye-opening, stunning and a gift as I was overseeing the special education programs for the County Office of Education in San Luis Obispo which included services for the orthopedically impaired. I spent six weeks in a wheelchair and four weeks on crutches and discovered that what might meet the legal requirement of being handicap accessible and what meets the functional requirement of being handicap accessible are two very different things particularly when it comes to parking, navigating entry through a closed door and using the restroom. There were some more challenging and memorable highlights both in schools and in public places at that time that I was reminded of yesterday. My favorite of the challenges I faced was going to use the restroom in a facility specifically designed for the orthopedically impaired. Upon rolling into a restroom, I discovered it was being used for storage. I rolled in, the door automatically shut behind me, there were no sensor lights so I found myself in the dark and because of all the boxes in the restroom could not turn the wheelchair around. I had to wait several minutes before I heard someone outside the door to whom I could call for help. I traveled to a lot of different school sites throughout the county and was surprised to find how many handicapped parking spots are at the bottom of a hill and how many parking lots and sidewalks leading up to our schools have cracks with large bumps in them. Looking uphill and knowing the amount of upper body strength it would take to get where I needed to go often felt daunting. Scarier was looking downhill and being conscientious of not gaining too much speed and being able to come to a stop. I gained a new appreciation for why people in wheelchairs wear gloves. 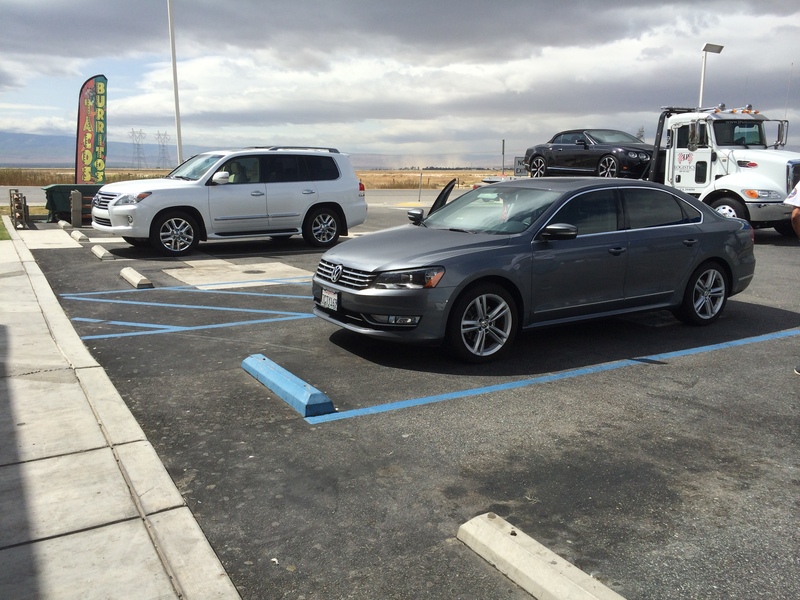 I was also surprised by the parking available and people’s perception of handicap parking. In the downtown area of a town I spend quite a bit of time in, all the parking at that time was in alleyways. In addition to receiving a very clear message that there was a community interest in hiding the disabled, the other challenge was that the culture of the community lent itself to a lot of four wheel drive trucks that also parked in these alleyways. It was not uncommon to get out of the vehicle and realize that the truck pulling out directly behind my car could not see me at wheelchair height. I quickly realized that going downtown was not a wise idea. I am however proud of this community as it has since that time changed it’s handicap parking layout and curb accessibility. At one of the school’s I frequented a couple of times a week, I was originally impressed by the forethought put into the handicap parking. The parking lot sat quite a distance away from the campus, but just in front of the bus loading and unloading zone was a blue handicap parking zone with two easily accessible ramps with well designed inclines that took out the daunting feeling that often came with the uphill haul at other facilities and the speedy downhill trips. I soon discovered though that the culture of the school community, viewed the handicap parking zone as the principal described to me, “a suggestion.” It was agreed within the school community that the parking lot really was quite a ways away and it was easier for parents to just be able to park in the handicap zone. I’m finding myself temporarily on crutches again and not able to bear weight on my right hip. After a week of being home and mostly bed bound, I was able to venture out into the world again yesterday. My husband and I had a three and a half hour trip each way to get to a follow up appointment which meant stops to use the restroom, stretch and grab a bite to eat. 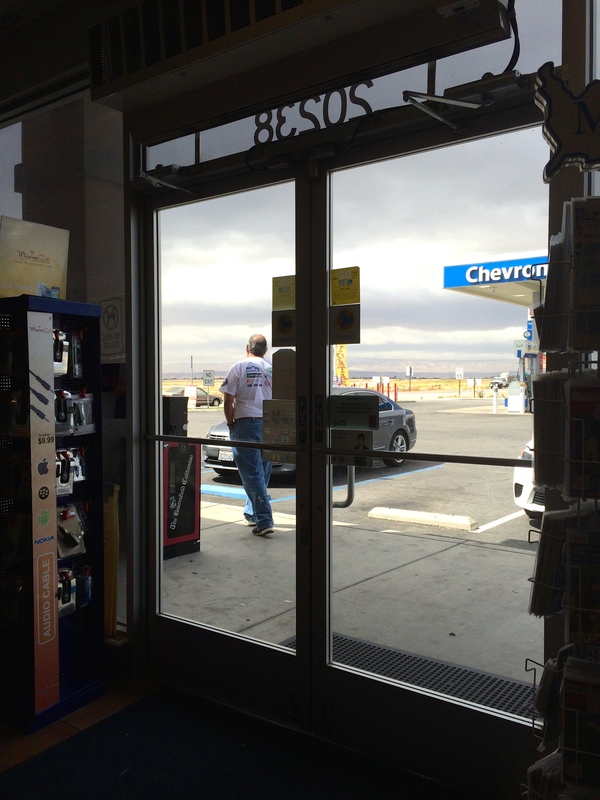 Our first stop quickly took me back to some of the experiences I had a few years ago. …I soon found myself with the first hurdle. I was lucky enough to have my husband with me, but wanting to be independent created a roadblock. How do I pull open one of these doors without bearing excessive weight on my hip and still holding on to both crutches while also moving forward as gravity starts closing the door? The weight of the door will make a big difference to the success of this task. 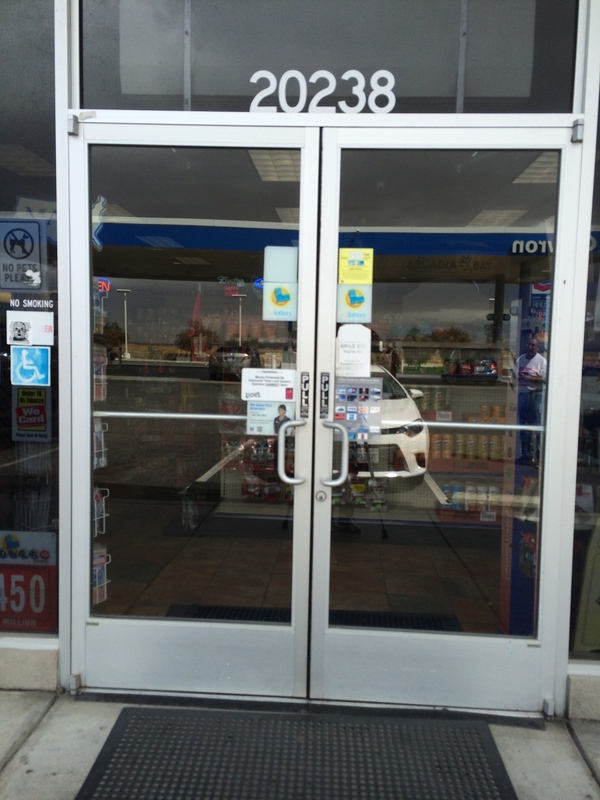 This door however – too heavy for success. I was blessed with one of the kindest moments from a stranger as I stood to take a picture thinking about the blog post I wanted to write. A very kind gentleman, who I soon discovered spoke a limited amount of English, looked at the situation and used one word, “Help?” The moment felt like a blessing, not because of the offer of help, but because of the kindness and compassion that was in this gentleman’s eyes. I wish I could share my mental picture of this man. Challenges can bring out the best in humanity and this gentleman exuded goodness. 24 hours later and my heart is still warmed by the kindness not only of his gesture, but the expression of it. The next obstacle – how do I push down on that handle, push the door open, stay on my crutches and protect my hip? Hmmmmm, I’m glad my husband was with me. This one was a little tougher. The door was closed when I walked in, and the hinges slightly off center, caused it to stick. Once I got the door open, it didn’t start to come back and close automatically like many doors of handicap accessible facilities. 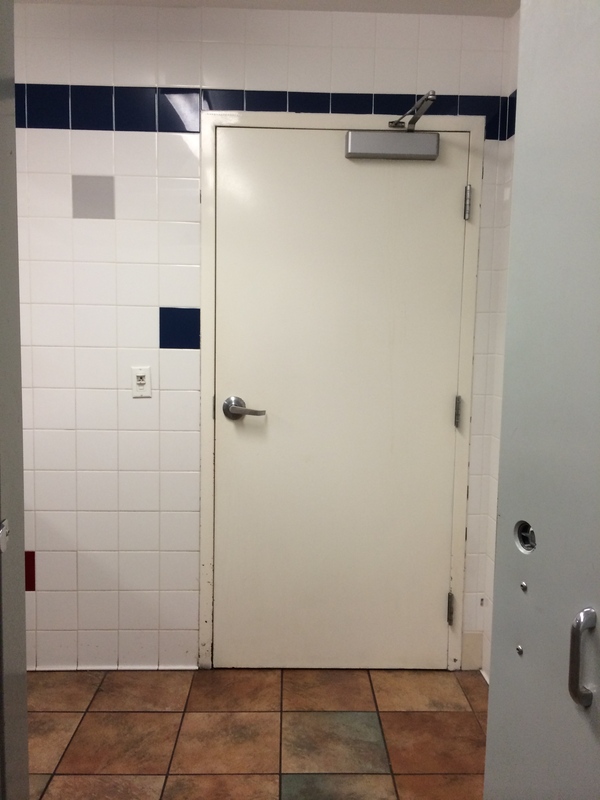 Once in the stall that door was going to need to be closed – a slow but sure process. Darn, wish my husband could come in here with me. Next, two doors to navigate to get out. The first one sticks which normally wouldn’t be that big of a deal, but crutches are a game changer. 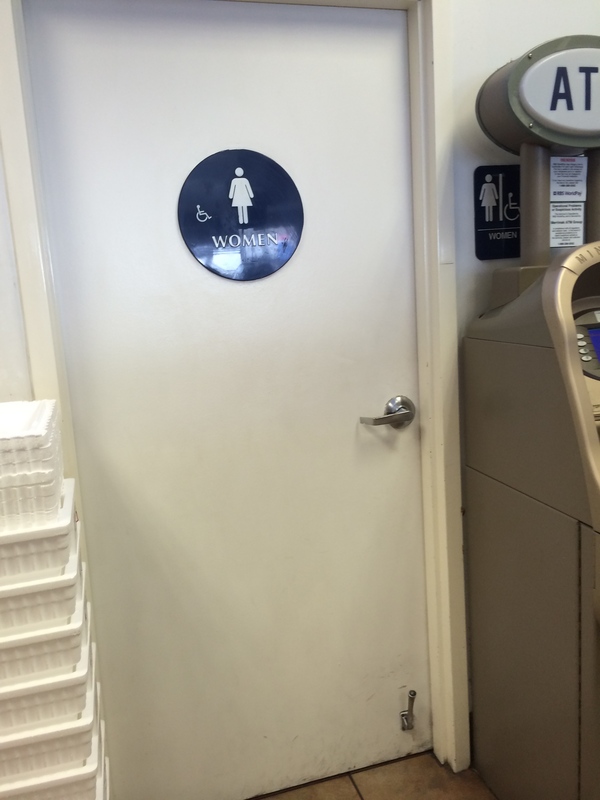 Next, I found myself eyeing the handle on the second door thinking, “Seriously, what is up with the handles around here?” As I got the door open to exit the restroom, one of the store employees had come in to check the toilet paper. She snuck around to my right, navigating around my crutch and thanked me for opening the door for her. Hmmmmm. Ah, almost out of here. I can totally navigate this door with a little left hip action. Whoops, I forgot how heavy this door is and it’s not going to happen. God bless my husband who’s on the other side of the door, being patient with me and my photo shoot, knowing that it’s best to let me discover that I need his help before stepping in and opening the door for me. It’s hard to lose one’s ability to move around independently. I’m glad my glimpses into the world of physical disabilities have been temporary and short lived. 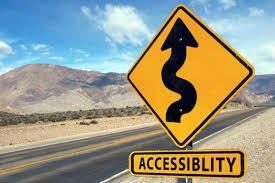 I am however struck, that given the assistive technology at our disposable and our knowledge of physics concepts, how difficult it can still be to get around independently. It is my hope that by sharing my experience, someone will hear or read this story and use the content to consider design and the associated physics concepts when creating accessible environments. I also hope that it assists us in stepping in to help others with compassion and an understanding of the desire for independence on the part of those who find themselves with physical limitations, whether they be temporary or permanent, when they require assistance in gaining access to the places we normally take for granted. *As a side note, I’d like to share a shout out to Jack in the Box. The rest of our stops for the day were at Jack in the Box locations. At each location, the ramps were easy to access, the doors were light and easy to push through and also closed gently on their own. 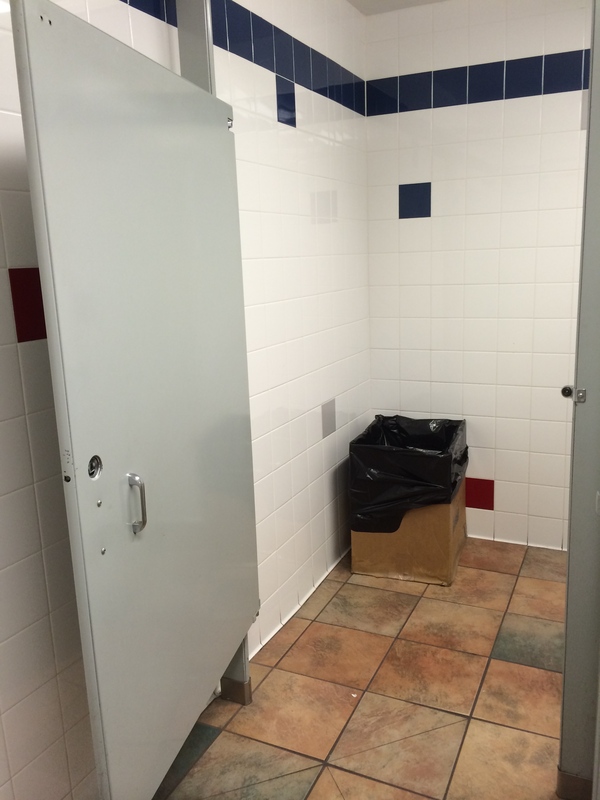 While I’m not usually a fast food kinda gal, I know Jack in the Box will get my business whenever we’re on the road out of my respect and appreciation for their accessibility design.